After finishing the 100 miles at Umstead , Amy told me that she now wanted to back off of the ultra's for awhile and get back to some speedwork with the next big goal of qualifying for the Boston Marathon. We had a lot of discussion over how and when she wanted to accomplish this over the next few weeks of recovery runs and it was decided that the first attempt would be at the Tobacco Road Marathon in March of 2013. We both knew going into this that being ready that soon was going to be very difficult and in reality was a long shot at best. Not that she didn't have the potential to do it as I have mentioned many times before, but due to the fact that her best time was 4:06 and her qualifying time is 3:40. I told her to just make sure she was recovered well, have some fun over the next couple of months and try to build up her mileage as much as possible over the the summer with trying to add at least one more day a week of running. Consistency was going to be crucial for the plan to work. We had already added a normal Tuesday afternoon run together and with the Thursday night Social series runs she just needed to try and add at least one more run to her schedule. 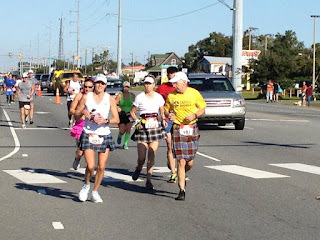 In the meantime I was working out a schedule for our training to come later on and also we planned on doing the OBX Marathon in November to see how things were progressing and then a test at the Myrtle beach Half Marathon in Feb 2013 as a final test to see if we were on track. I was of course now in the Grand Experiment 2 which for those of you not up to speed meant I was going to try and get myself back into 3:40 marathon shape while still having a couple of 100 milers, a 24 hour race, a 50k and then a 50 mile pr attempt mixed in with the training. Of course both of us encountered a huge setback after the dog attack at my 100 mile Double Boogie attempt in June and it was late July before I was back to running my normal pace again without feeling worn down. So by August it was time to begin doing some hill work and throwing in some strides every now and then to get our legs prepared for the hard work to come. By this point Amy and I have running a lot together for a 3 years and in fact for the year of 2012 she ended up with one if not her biggest mileage years ever and about 60% or more of those we ran together. We had become the best of friends and I had shared a lot of advice with her but now I was going to more a less take on the role of her coach over the next several months prescribing the phases of her runs and specific workouts to achieve the goal. I would find out very quickly that it was a very good thing that I do know her so well and understand her because I learned right from the beginning that I was going to have to be very flexible and adaptable with the training as you will see. And I had to be flexible and adapt from day 1 ! Yep, right when I was hoping she would be piling on some miles, she decided to do a 3 week "cleansing diet" and was not suppose to do any running or working out during that period. OK. Soooo, instead of going from a strong base, we'll just pretend she has a good base and is going into the next phase well rested and ready to work hard. Fortunately she did do some running as well as some of her cross-training after all so she wasn't completely stale. I had my 24 hour run which turned out for me to just be 13 hours and 60 miles on Labor Day weekend and just a week and a half later we met for our first "official" workout for our goal. We met for the first of several gut busting hill repeat workouts that we would be doing over the next couple of months. These were not your normal hill repeats but max effort runs for 1/4 mile up a fairly steep hill so that "when " we made it to the top we were gasping and about to throw up. Fun Stuff ! This is just of of the many things I love about running with Amy. She thrives on this kind of stuff. That's one of the great things about coaching her is I don't have to worry if she is going to give 100% effort to a workout. We would usually end up nearly dying on some of these but would still be joking around and loving it. But right in the middle of this I had to make another one of those adjustments. Hinson Lake was coming up and although I felt we needed to stay focused on the marathon training , she wanted to run her age in miles since her birthday fell in the middle of the run. So I went to Hinson and ran with her at midnight as she crossed over and got her birthday miles in. Then after just a week to recover she had a 5k race so when we finally got together a few days later she was sore but I was in taper mode for my upcoming 100 at Oil Creek so we just ran a few times together the next couple of weeks taking it easy and planning the next phase. I was able to recover very quickly from the 84.5 mile beating I took at Oil Creek and we were both ready to resume the hard training a week and a half later with another torturous hill session. I did pretty good considering I was still in recovery and actually ran faster than the last time we did them but Amy was well rested and I noted in my journal, "she was on fire" and smoked me on all of them. Just a couple of weeks later we were at OBX and basically running it with no taper other than a couple of easy days before the race. I had a disappointing race but not really unexpected with the hard race a month before and hard training in between. Amy was a little disappointed not to go under 4 hours but she too had been working hard and she still had a lot of positives from the race including a pr by a couple of minutes and she was able to push it hard the last 10k after not feeling too well in the middle miles. The next couple of weeks were for recovery and we met for a few easy runs and then I did the Derby 50k for a long training run as part of my planning for the 50 mile pr attempt coming up in January while Amy ran an 8k Turkey Trot for Thanksgiving. No recovery allowed for me. Just three days later we ran a 5 miler and then the next day we were right back at normal pace. Let me step back here for a second and explain a little about the training plan. Normally after a base period, there is a strength phase, a stamina phase and then speed work followed by the taper. I chose to try something different that a lot of the Kenyans coaches use which puts the speed work before the stamina, which in theory makes it easier to maintain race pace in the final phase because for the marathon holding the pace for a long time is the most important thing. The next couple of workouts are pretty typical of how our training sessions go. We had done a long run in Umstead and Amy just wasn't feeling it so we walked some of the hills. Well, on Monday , the first week of December, I really wanted to start us off on the speed training but planned to ease into it with a fartlek type session just to get the legs used to moving faster and go through a range of paces. We were early into the workout and I was trying to get us to do a mile at marathon goal pace but I could tell Amy was working too hard to hold the pace so I shut it down at the half figuirng she needed a little more warm up. Then we did a qtr at tempo pace and then a mile at marathon pace. She was tired but as we came to a little hill in our cool down I made her do a hill sprint. She gave me a look that could kill and I just laughed and giggled as we finished our coo ldown. She has a word for me when i do those things which I won't repeat here but I have a song that I sing to her that fits the name. So the next day we are running into Umstead from the Art Museum and thnking it's going to be an easy day. Well, no. Amy is feeling good and she gets her revenge on the run back up by putting the hammer down the last uphill mile which ends up being at tempo pace. I couldn't hang with her the last qtr and ended up about 5 seconds back and gasping thinking if I had to run another ten yards my heart would burst. Yep fun stuff !